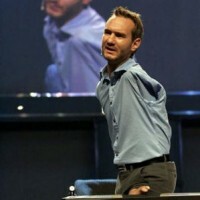 God is using Nick Vujicic to introduce people around the world to the transforming power of JESUS CHRIST. I already have two posts on Nick – Nick on Oprah Winfrey’s Show and Nick in Cambodia. If you didn’t see Nick on 60 Minutes take a look on YouTube. On 22 October Nick arrived in Montevideo, Uruguay, to talk about the freedom God has given him. Vujicic spoke boldly about the transforming power of God’s Word before politicians and journalists at Uruguay’s House of Parliament. Thousands of Uruguayans watched on television. Director of Operation Mobilization, Uruguay, Alejandro Las, was appointed as his official translator. President Mujica also met with Vujicic and they joined in prayer as Alejandro translated. “In the last few years it must have been the closest encounter he has had with the gospel in his life,” reflected Alejandro. The front page of the Uruguayan newspaper the next morning proclaimed, “Vujicic Challenges Abortion Laws at Teleton”. His time at the centre for handicapped children brought a great deal of media attention, which he used to proclaim a biblical perspective on abortion. In a press conference soon after, an OM journalist asked him about his views on separation of church and state. The streets in Montevideo were covered wall to wall with posters of Nick Vujicic. His testimony was aired on the three largest secular television channels in the country: Teledoce, Canal 4 and Canal 10. At the Rambla, the recreational coastline of Montevideo, nearly 15,000 people stood for two hours in the chilly night air to hear what he had to say. “If you want to know about the peace that has set me free, that will set you free, lift up your hand,” he shouted. As Alejandro fervently translated the message, a drug addict standing near the OM team raised his hand. Another hand went up. Followed by another. The dark sky over Montevideo’s shoreline witnessed hundreds of hands go up as individuals indicated a desire to know the transforming power of Jesus Christ. What a FAITH story this is: Nick empowered by The Holy Spirit is impacting the world for JESUS CHRIST, his Lord and Saviour.